The clock is ticking on that baby growing in J’s belly. We’re down to one week before the actual due date which means J and I are getting the last little bit of sleep we can get before everything changes. It was after breakfast by the time we woke up this morning and neither of us got moving very fast. I still had some left over pizza from last night that we snacked on until it was full on time for lunch. 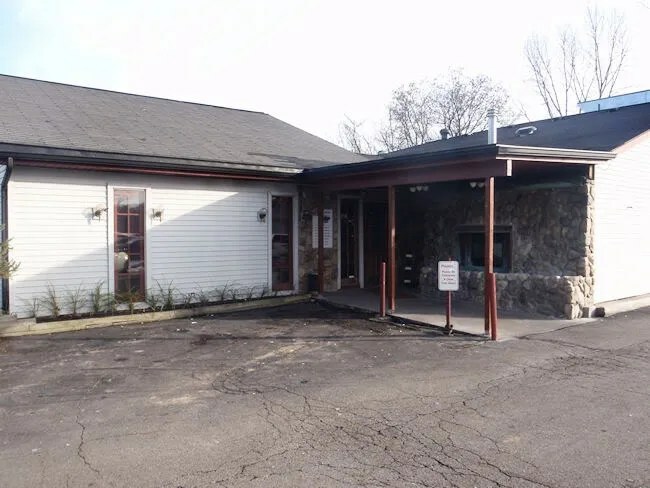 I didn’t really have any solid ideas about where to go for lunch, but I was sort of thinking of a little sports bar I noticed one day on my way to Parchment. It’s kind of out in the middle of nowhere so I was a little hesitant, but I found a menu online and we were sold. The Sports Forum is on Mosel Avenue in Kalamazoo Township between Westnedge and Douglas Avenues. It’s right off the US 131 BL but if you’re coming from the south, it can be a little tricky to get to. When I mapped it from Oshtemo, the quickest route was to go all the way down town and north on Riverview to Mosel right on the edge of Parchment. We were a little hesitant driving to an unknown place because we were both pretty hungry and not in the mood for disappointment. We were both a little relieved when we spotted the place and noticed a pretty full parking lot for a Sunday afternoon. 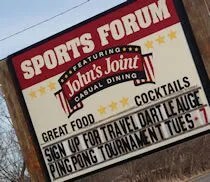 The Sports Forum is more than just a sports bar although that’s the main feature. There’s a formal dining room they call John’s Joint and a banquet space on the other end of the building. The sports bar is kind of sandwiched between the two other spaces. J and I walked in and headed for a table past the bar. While there were quite a few cars in the parking lot, all of them were guys sitting at the bar. J and I were the only diners at the time. The bartender was also the waitress and she came over with a couple menus right after we sat down. We both stuck to pop for drinks. I got a Pepsi while J got a 7-Up. As we were sitting down, my phone rang and I had to take the call. It was bad timing because the waitress was just walking over. She told J about the specials and J passed them on to me. Before the meal, J was feeling an appetizer. 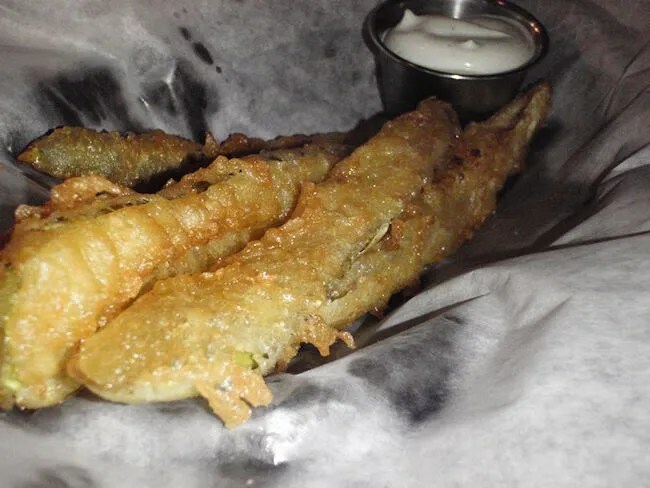 I know this seems awfully stereotypical, but, yes, the pregnant woman ordered fried pickles. We were both a little surprised by what we got because usually fried pickles are bread and butter pickles cut into medallions. This was a whole dill pickle sliced length wise and deep fried. It was served with what we believe is a spicy ranch. I ate one of the pickle spears which was good, but not really my thing. J said she liked them but would have preferred the medallions instead. It didn’t really stop her as she ate three of the spears. Usually, I would have went straight for the burger. It’s actually what I was in the mood for when we walked in, but fortunately, the waitress ignored my rudeness and still went ahead with the specials. On Sunday, they do what we were told is kind of their signature special. 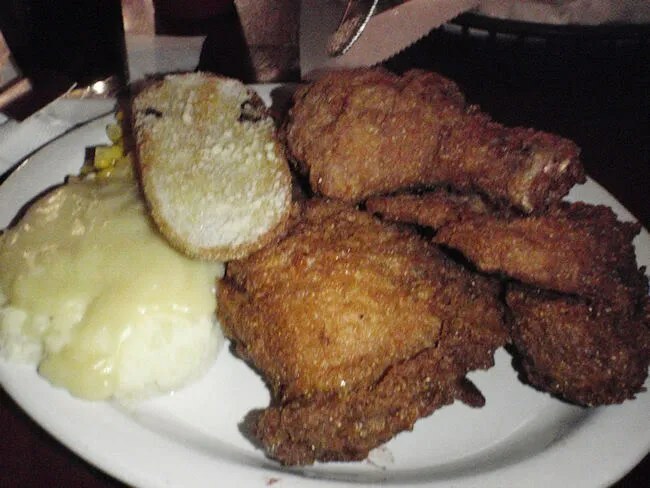 Four pieces of hand battered Fried Chicken, home made mashed potatoes, corn, and bread for $6.95. I couldn’t pass that up. The potatoes and the corn weren’t really on my radar, but good, home made fried chicken was and one bite in, I was very thankful I went with my gut. The chicken had a very crispy, golden brown batter that clung to the juicy tender chicken meat. I started with the smaller pieces because of the immense heat that was coming off the freshly fried chicken. The four pieces on the plate were a leg, a breast, a wing, and a thigh. By the time I got through all four pieces, I don’t think I could have eaten the sides even if I wanted to. J asked if she could have some of my potatoes and I saw no reason to let them go to waste. She said they were creamy and smooth and had that home made kiss to them. The piece of bread that came with the meal was a slice of garlic bread which was delicious although I was expecting more of a dinner roll when I ordered. Didn’t matter. I scarfed it down. J was also thinking fried chicken, but she’s not a dark meat eater. We joked later she could have ordered it and taken the dark meat home for me later, but she stuck to one of her favorite bar food options, the grilled cheese. 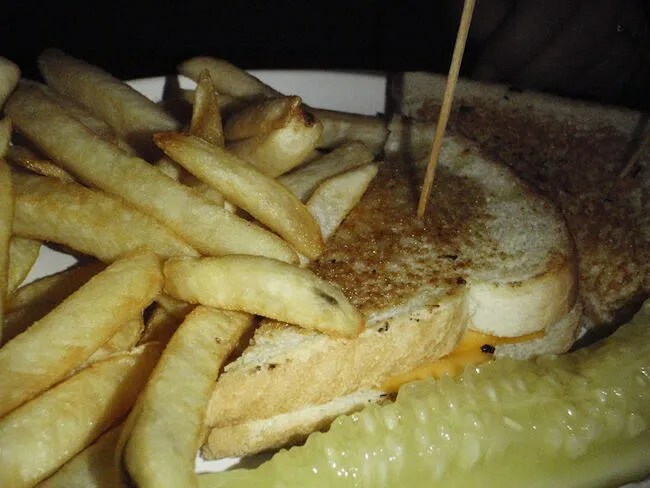 Her sandwich was a pretty simple grilled cheese with American cheese between two pieces of white bread. Her sandwich came with fries and another pickle and she cleaned her plate. Our bill was a little under $22 before tip and I gotta say, that fried chicken dinner is going to be right up there as one of the best values in Kalamazoo County. The chicken was delicious and you get a full plate for a little under $7. The Sports Forum is one of those places were the regulars feel comfortable yet outsiders can venture in for a pretty solid pub grub meal. The decor is dated and the chairs are a little uncomfortable but those are the things that add charm to the place. I was just expecting a one and done for us when we walked in, but that chicken dinner is enough to make me consider it again. That chicken dinner is killer and almost to much food. Their fish dinner is really good too, but so is everything else they serve.